20 mm Oerlikon Mk42 х 1 pcs. Sims — American premium Tier VII destroyer. A well-armed high-speed destroyer with excellent maneuverability. High rate of fire and excellent aiming speeds for her dual-purpose artillery mounts ensured good firepower and efficient AA defenses for her time. Sims was first sold in pre-order bundles from 8 April through 25 June 2015. Fans of the American destroyer line will be very comfortable in Tier VII premium Sims. She's fast, highly maneuverable, her guns spit out shells at a amazing 18 rounds per minute, and they turn fast... very fast. Her surface detectability is somewhat high as is typical of mid-tier American destroyers, but is lower than that of her tech tree cousin Mahan at just 7.3 km. Her turning radius is a mere 500 meters, allowing her to quickly and decisively dodge incoming shells and torpedoes. Sims captains have a choice of torpedo modules, one that will portend how they intend to play her. Aggressive captains can equip the Mk15 mod. 0 torpedoes and fight in close quarters and around islands. She inherits this style of play from her predecessors like Nicholas and Farragut. Conversely, cagier captains can equip the Bliss Leavitt Mk7 mod. 2B torpedoes and fire them from stealth; however, the longer-legged torpedoes only do a little more than 8,000 damage a pop and travel at a snail-like 49 knots. While the ability to fire torpedoes from beyond her detection range is good practice for Benson and later American destroyers - and a capability that her lower-tier cousins do not have - in this configuration, Sims’ torpedo armament is best described as "anemic". While her guns have low chance per shell of setting ships on fire, they put out so many shells that a target being focused will probably catch fire eventually. A reasonable marksman can — with some practice — hit sluggish capital ships like battleships and carriers over and over and over at medium range. She's also very capable of engaging other destroyers at ranges under 7.0 km and quickly dispatching them with her high rate of fire. Two centerline-mounted quadruple torpedo launchers, each one able to fire to both sides. Guns have very fast turret traverse; they are always on target. High rate of fire from her main battery. Fastest American destroyer in the game with a top speed of 38.5 knots. 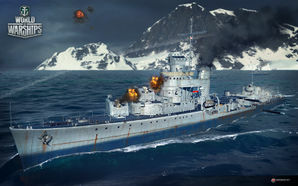 Can mount the Defensive AA Fire ( ) consumable; Sims’ AA can be made fairly respectable with the right mix of commander skills, upgrades, and signal flags. Can fire up to a range of 15.5km with a captain with Advanced Firing Training. Outstanding turning circle radius of only 500m. Very fragile armor and modules. The Bliss-Leavitt torpedoes are very slow at 49 knots and only deal 8,500 maximum damage. The Mk 15 mod. 0 torpedoes are fast and deal decent damage, but have a fairly short range. Like all American destroyers equipped with 127mm guns, she suffers from the notorious 'rainbow' shell arc; it's hard to hit ships at long range. Stock (unbuffed) AA is weak. Has one less main battery gun than Mahan. Above-average detectability for a Tier VII destroyer. As a premium ship, Sims doesn't have any upgrades to research. A gunboat destroyer such as Sims is inevitably going to come under heavy fire; the abbreviated cooldown on Damage Control Party II ( ) will eventually pay for itself. Shelling out the doubloons or credits here is highly recommended. Paying for Smoke Generator II ( ) is captain's choice, but there are times that the shortened cooldown on smoke is the difference between sneaking away and going to the bottom. As a premium ship, Sims comes included with Type 10 camouflage that lowers her detection radius, reduces the accuracy of incoming shells, reduces her repair costs, and increases the amount of experience she earns. in-game configuration represents later modifications. 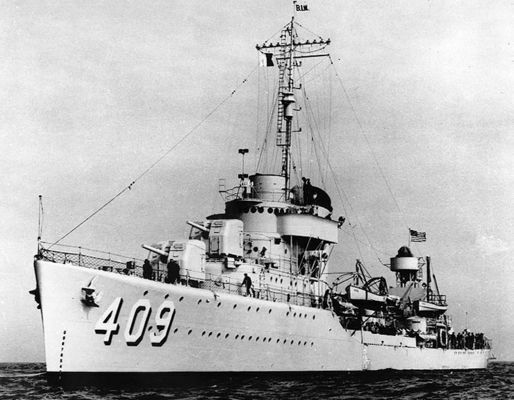 USS Sims (DD-409), lead ship of the class, on trials in 1939. The Mk 37 gun director has not yet been installed. The Sims class of 12 destroyers was built for the United States Navy, and commissioned throughout 1939 and 1940. They were the last United States destroyer class completed prior to the American entry into World War II. All Sims-class ships saw action in World War II, and seven survived the war. No ship of this class saw service after 1946. They were built under the Second London Naval Treaty, in which the tonnage limit on destroyer standard displacement was lifted, but an overall tonnage limit remained. Thus, to maximize the number of destroyers and avoid developing an all-new design, the Sims class were only 70 tons larger as designed than previous destroyers. They are usually grouped with the 1500-ton classes and were the sixth destroyer class since production resumed with the Farragut class in 1932. The class served extensively in World War II, and five of the class were lost in the war. Of the five ships lost, four were at the hands of the Japanese and one at the hands of the Germans. The class served on Neutrality Patrols in the Atlantic in 1940-41. Except for Roe, Wainwright, and Buck, the class was transferred to the Pacific shortly after the attack on Pearl Harbor. All of the ships saw extensive combat service. At the war's end in August 1945, three of the seven survivors were undergoing overhauls that were left unfinished, and were ultimately scrapped. The remaining four seaworthy ships were used as targets during the 1946 Operation Crossroads atomic tests at Bikini Atoll. One was sunk by the Able blast, while the other three were sunk as targets two years later after serving as experimental platforms. Sims’ Measure 12 (modified) camouflage is missing. She wore this scheme at the time of her loss. Premium camouflage resembles the Measure 32 Design 1D scheme, which was applied to surviving Sims-class destroyers in 1944; Sims was sunk in May 1942. Launching of USS Sims (DD-409), 8 April 1939. Sims at anchor, date and location unknown. USS Russell (DD-414), possibly as in 1941 with Mount 53 still equipped and K-guns added. Russell (left) and Sims (right) in December 1941. As clearly shown in this photo, the gun tubs behind 'B' turret has two single 20mm Oerlikons; the in-game model has two single M2 Brownings. Mk 37 Director ca. 1944 with Mk 12 (rectangular antenna) and Mk 22 "orange peel" radar antennas. This page was last modified on 1 July 2018, at 03:45. This page has been accessed 99,307 times.